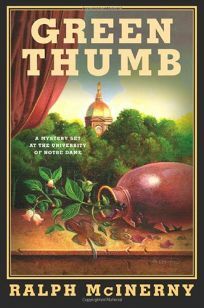 Long-germinating grudges blossom into bloody revenge in Ralph McInerny's Green Thumb: A Mystery Set at the University of Notre Dame, the eighth entry in a light series noted for its Irish wit and wisdom. When an eminent Notre Dame alumnus and benefactor drops dead on the sixth green of the old golf course, brothers Philip and Roger Knight end up digging into the tangled roots of long-ago relationships among the class of 1977. Agent, Stuart Krichevsky. .